A popular rapper today identified the wrong man as one of the two Louisiana cops being investigated in connection with the shooting death of Alton Sterling. 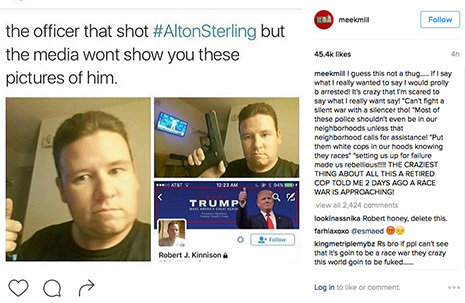 In a post this morning to his Instagram page--which has 9.5 million followers--Meek Mill (real name: Robert Williams) posted two photos of Robert J. Kinnison as well as a screen grab of a portion of Kinnison’s Twitter page containing his name. Except that Kinnison is not a cop. He describes himself as a trucker from Arizona. Police have named Blane Salamoni and Howie Lake as the officers involved in Tuesday night’s shooting of Sterling, 37, outside a Baton Rouge convenience store. 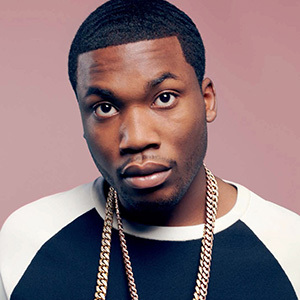 Meek Mill (seen at right) appears to have further disseminated images that were either first published to Twitter or Instagram. One of the photos shows Kinnison, 33, holding a Glock handgun, while his Twitter page includes a picture of Donald Trump and the Republican candidate’s “Make America Great Again” slogan. Williams, 29, is best known for dating fellow rapper Nicki Minaj and getting scorched during a feud last year with the singer Drake. Following the 2012 shooting death of Trayvon Martin, director Spike Lee sent out a Twitter message including what he said was the home address of gunman George Zimmerman. But the address Lee tweeted to his 240,000 followers was actually the residence of an elderly Florida couple with no connection to Zimmerman or the shooting case. Realizing his mistake, Lee quickly apologized to the couple--who had received numerous death threats--and paid them $10,000 as part of a settlement agreement.